We’re going to give the community a peek into some Supernode Candidates. Your vote matters a lot, and we’d like to emphasize that while we are trying to provide accurate materials, much of this information is subject to change depending on each supernode. We will continue reporting on the Supernode Candidates for next week, but we encourage our readers to be proactive about researching who you are voting for and who may control our consensus; a high voter reward may not always be the best choice. This is supernode group formed by dedicated members of the Cyber Republic, members like Michael S., Chris Mac, Chinicci, Dexter, and KenNinja who are well-known throughout the community. What started as five members quickly grew into twelve because, “with a few more heads put together, we found that we could build something really great.” The aim is to run three Supernodes (SN) with a very fair reward distribution that’s primary purpose is to contribute to the ecosystem in a sustainable way. The three SN’s will be named Callisto, Ganymede, and Titan, after the biggest moons in the Solar System, and each node would be run in a different continent as the team is composed of members from several countries: U.S.A., Morocco, New Zealand, England, Germany, and Belgium. In terms of developing a script to streamline the payouts to team members and potential voters, there are experienced coders and programmers in the pool that will take care of this code and ensure that it’s 100% done through smart contracts and scripts. No exact numbers have been officially released for voter rewards yet. Also, prominent CR member Michael S. has a personal Supernode he’s hoping to run from his hometown in Houston, Texas, and he looks forward to contributing to the DPoS Consensus. This group formed in China was featured in detail in the last two Weekly Updates. Their Wechat group is called League_of_Elastos. They are recruiting 36 node candidates and others as voters. More members will secure some (or all) candidates to be the stand-by nodes. If any of the candidates are elected as active nodes, the profit shared among each member will be significantly increased. Their members include two types, Node Committee Members (NCMs) and Voting Members (VMs). There are 36 NCMs that will lock up 5,000 to participate in the Elections. VMs place their votes toward the 36 NCMs. If any NCM is elected, the profit minus the running costs is distributed to members at a weight of 2 for NCMs and 1 for VMs. The Alliance is stated to be a non-profit organization. They seek to provide a way for token holders to benefit directly from DPoS Node Elections and prevent the collusion of whales. Essentially, the goal is for all possible profits to be distributed to voters. In terms of whether they are working on a script, too, they are hoping that an open source solution that the whole community can use will become available. Damiano manages several groups with around 20k members and is the admin of Elastos Italia. He is confident he can promote his supernode effectively, especially as his group prioritizes transparency and communication with the community. This is a diversified group of 10 members looking to run two nodes in the U.S.A. Their other members are from France, the United Kingdom, and Canada. In terms of rewards, the team has stated they will be giving out the best payouts possible in order to stay competitive with the rest of the pools (Preliminary numbers are 80% rewards to voters and 20% rewards to team members). The team is also looking for an open source solution for scripting. The team is developing a thorough Google Doc of their mission statement, and they will be creating a website along with various social media outlets to spread the word about their pool. They sum up their values in 5 words: Empathy (genuine human interaction), Grit (results come from mistakes) , Patience (because fast and good don’t coexist in perfection), Wild Actions (actions are better than words) and Fun (life is a game). The team is excited to participate in the DPoS Consensus Node Elections. The community’s very own Telegram administrator “T.I.” is also looking to run his own Supernode. He will run the Supernode on a cloud service system like AWS. If you didn’t know, T.I. is the sole contributor to the ELA News website and is very passionate about dedicating his time to the community. Another prominent community member looking to run a Participant Supernode is none other than Brian from the DMA project. He and his team are very excited to participate in order to maintain proper and reliable Consensus throughout the Ecosystem. He shares his thought process in hosting a node and what their prerogative will be for the community: “As the Supernode election is nearing, myself and the team were thinking about whether or not we need to participate, and how we would go about doing this. This is clearly a very important step for the Elastos infrastructure and community, so we decided to have an internal discussion of the qualifications needed to run an elected Supernode. “We don’t want to just run the elected node and profit by ourselves. It must be shareable. So the plan is simple and direct: Share the earnings with all contributors on a regular basis. To make the sharing completely fair, we can write the script to put the incentive plan in the code, and have people put their trust in the code, not the human. We also need to create some tools to let each contributor view the data easily. The incentive model can be designed based on multiple factors. Since we are the team that built DMA, we have a very strong technical background to build such a script and run it in a fair condition. Otherwise, we will not only lose the node, but also lose the reputation of one of the important ecosystem contributors. Last but not least, the node service should be expandable. We can put more add-value services on to the servers behind the node. For example, there might be a personal cloud disk service, DMA-powered extended business-stub service, etc. It can be continuously working along the basic node service the team can offer. All these services can be hosted by any elected node if they want. The earnings can be combined with the basic node service income. Thus, the earning of running such value-added services will be the additional share to the node supporters and contributors. The team will be reaching out to the community through all the proper social media outlets along with potentially creating a website for his group’s candidacy. If interested, they invite community members to join their node. You can reach the team at supernode@elastosdma.org. We all thank Brian for his continued efforts with the ever expanding DMA project and wish him luck in the election process. 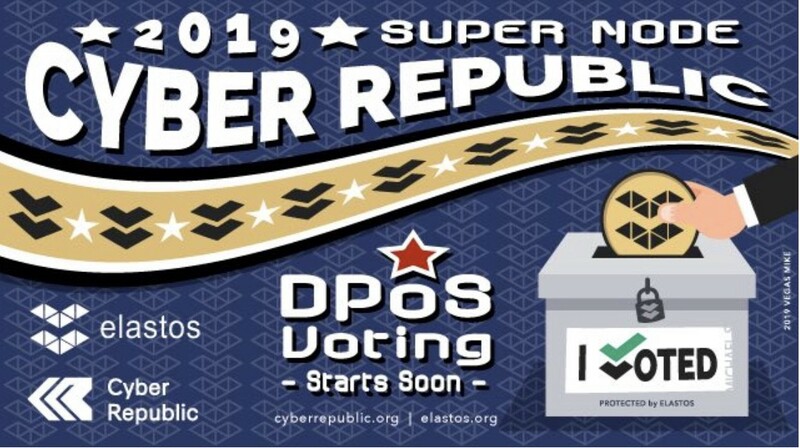 Thanks to all the Supernode candidates that took time to speak with the Cyber Republic Weekly Newsletter. We are actively seeking information on other Supernode Candidates, so look out for next week’s edition. Any Supernode Candidates that would like to be profiled can contact @espiritdecorps912 on Telegram, or by email at jeremygordon@cyberrpublic.org to share information about your Supernode Candidacy. A diverse, robust community of skill-focused sub-groups whose leaders, developers, and organizers are working together to promote Elastos in our communities.